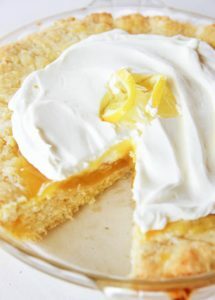 Easy cold lemon dessert (aka lemon lush) made with a crumbly crust and topped with creamy layers of whipped topping and lemon pudding. Sunshine on a plate. That’s what I’m calling it this wintery day. My mom has been making this lemon dessert again lately and it takes me back to when my grandma made it and called it lemon lush. I love the fresh lemon flavor so much that I decided to make it again to share with you. There’s something about a fresh fruity dessert in the winter that makes life feel like spring. No sunshine outside. No problem. I’ve got lemon lush. 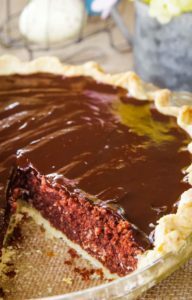 What I love about this dessert is the creamy texture with the crunch of the buttery crust. And just like this moist lemon cake you can make it a day ahead. It’s just about better than the first day you make it. You know I’m all about the practical in addition to the taste. The only downside to this cold dessert is that you do have to cool the crust after you bake it. I was in a rush to get this done before the sun was setting so I could get pictures for you. So out to the porch I went. I stayed close by afraid a bird, or some other animal, would want a taste. But the sunshine on my face felt soooo good! And the cool weather helped to cool the crust right down. 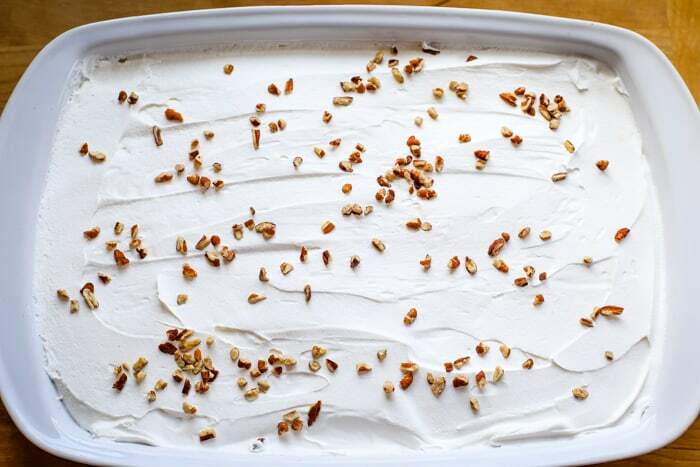 The first layer is is made with just flour, butter and pecans. 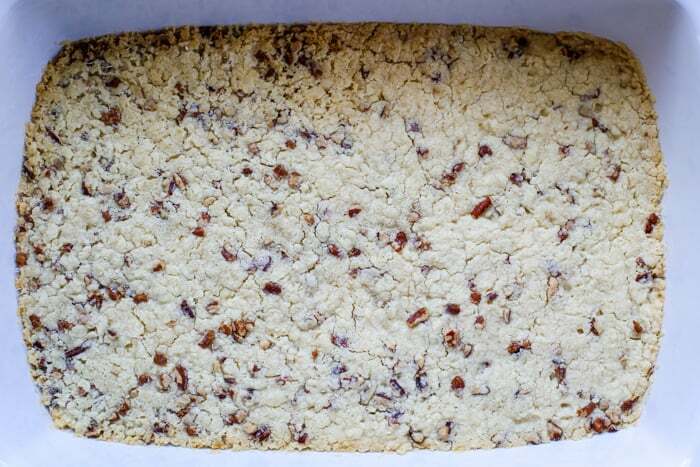 You mix and pat it into the bottom of a 9×13 pan. After baking for 20 minutes, you have a crumbly crust. Let cool completely before making the next layer. 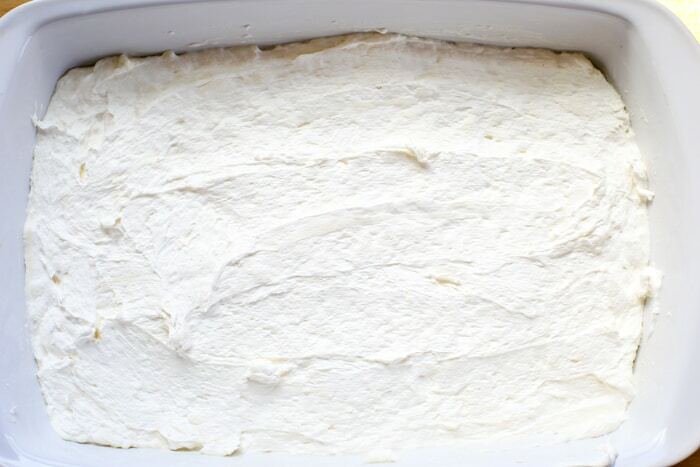 The second layer is a mixture of softened cream cheese, cool whip and sugar. Again, you just mix it up and spread onto the crust. I do recommend spooning it on and then carefully spreading it. The crust is crumbly so you want to gently add the second layer. 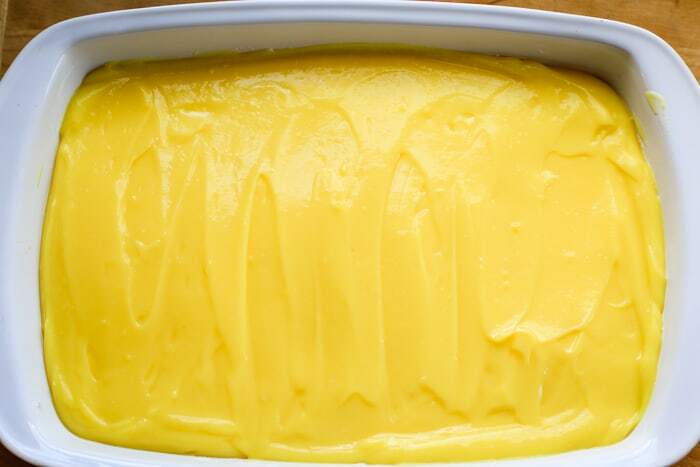 The third layer is lemon pudding. Mix instant lemon pudding and milk according to get this smooth layer. I do recommend buying Jell-O brand lemon pudding. The off-brands (including a very popular grocery store) just don’t have the same great flavor and creamy texture. The fourth layer is just cool whip with a sprinkle of pecans. So easy, right!? I hope you enjoy this dessert as much as we do around our home. I have to make sure I make this lemon lush recipe when I know I’ll be sharing it with others. I have no self control when it comes to this lemon dessert! Enjoy! Is this a tart lemon dessert? No, this is more of a savory lemon dessert. 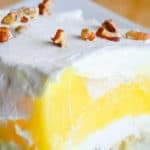 How do I make the lemon pudding layer more tart? You can add lemon peel to the lemon pudding. I would do this with a cook n’ serve pudding mix to really bring out the tart flavor. 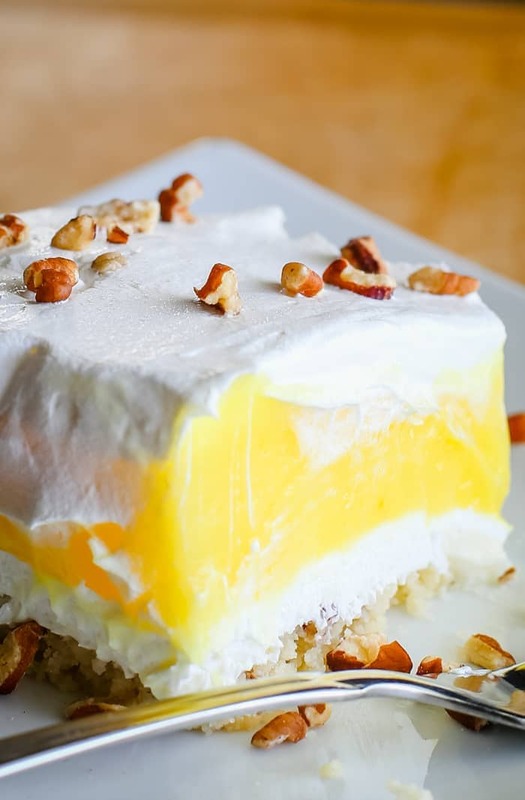 Can you freeze this dessert? Although I’ve not tried it, I can’t see why not. All these ingredients freeze well! 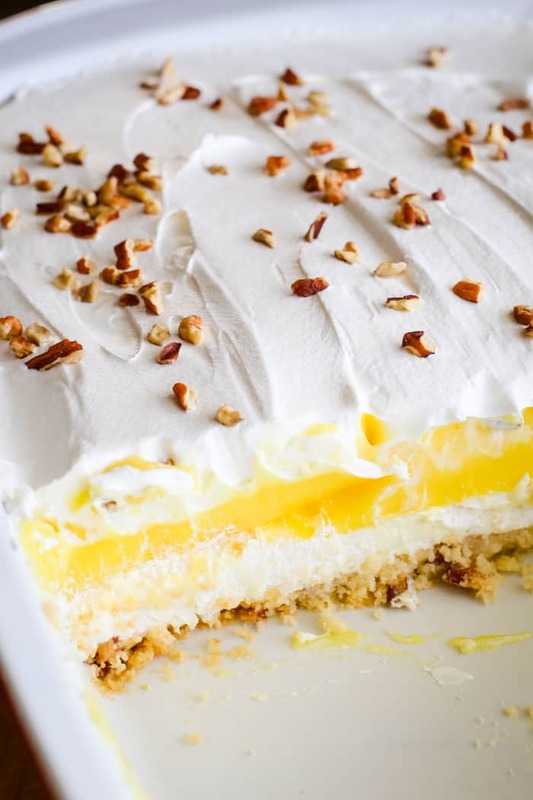 Can you make this lemon dessert without pecans or nuts? Yes. Just leave them out. You’ll miss out on the crunchy texture, but it will still be delicious. 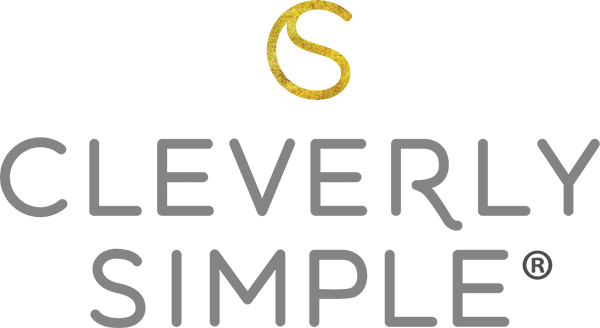 Can I use sugar free lemon pudding? Yes. But I can’t guarantee the same great taste. However, the texture should be the same using low fat and sugar free ingredients. 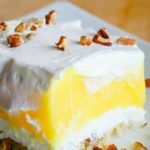 Easy cold lemon dessert (aka lemon lush) made with cream cheese and lemon pudding. 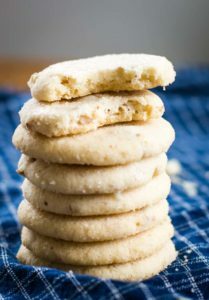 Cut butter into flour. Mix well and add pecans. 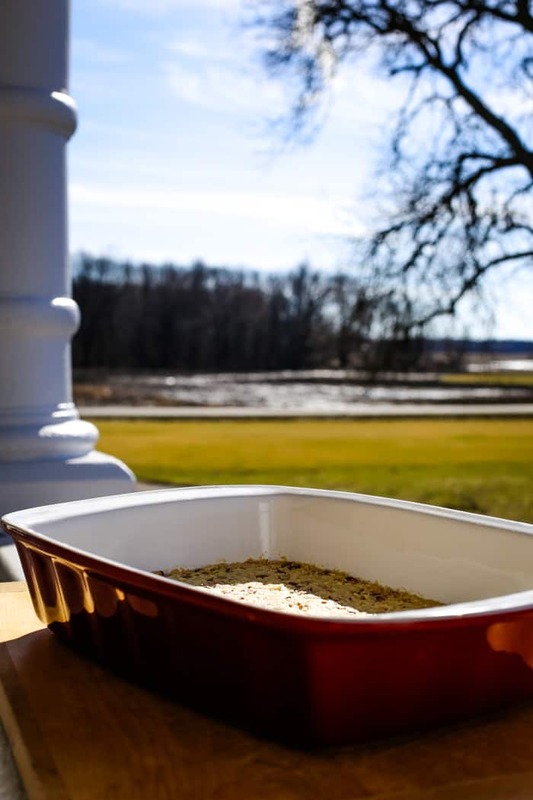 Pat into the bottom of a 9×13 pan and bake for 20 minutes or until golden brown. Let cool completely. Whip together softened cream cheese and powdered sugar. Fold in half of the cool whip (about 8 oz.). Spread over crust. Combine lemon pudding and milk. Beat until thick. 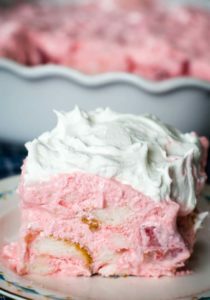 Spread over cream cheese layer. Spoon and swirl the remaining cool whip on top. Sprinkle with pecans. If making this ahead, it will keep for an entire day. I think it’s even better the second day! If you want to make a smaller dessert, you can cut the recipe in half and use a 9×9 pan. I highly recommend using Jell-O brand lemon pudding. I’ve tried a few off brands (specifically Kroger) and they did not have the same great lemon-y taste. That being said, even with the Kroger brand the final product was delicious! I made this for my family back 40 years ago and we also called it lemon lush. 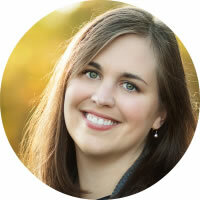 Did you ever live anywhere near North Andover, MA? No, we live in Ohio. It’s fascinating how good dessert recipes traveled! I won 2nd place in a dessert contest. They all wanted recipie. So easy. That is awesome!! It is really so easy that’s it’s amazing how good this lemon dessert is. Thanks for sharing your success!